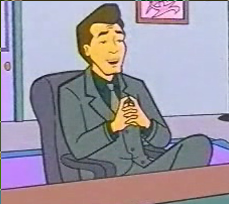 Leonard Lamm, voiced by Geoffrey Arend, appeared in "Fizz Ed". He negotiates and sets up the advertising contract between Lawndale High and Ultra Cola, dazzling Angela Li with mass jargon and promises of money, while quietly leaving out the drawbacks. As he put it: "our young people are our greatest resource. Therefore, let us mine that resource". In the face of Daria Morgendorffer asking questions, he cheerfully dodged each one. Four weeks in, he finally brought up the drawbacks - no money for the school unless it met its "quota" - and began to tighten the screws on Li, forcing her into ever dodgier ways to increase consumption. ("By the way... how are your students' grades this period?") He watched with disapproval when the Lawndale Lions lost a game due to too much Ultra Cola and revealed that a forfeited home game was itself a contract violation. This caused Li's breakdown which led to the contract being rewritten: ironically, this had likely cost Lamm a bigger job, as Superintendent Cartwright planned to have Lamm draw up contracts for all the schools. This page was last edited on 17 April 2018, at 17:09.